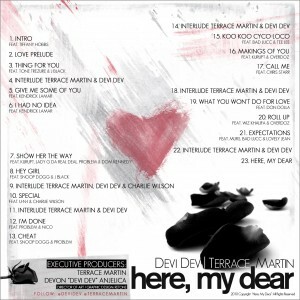 Inspired by a Marvin Gaye classic of the same name, “Here, My Dear” is a musical journey that details the hectic array of directions and emotional rides love takes you on. The project started out as a way for Terrace to express himself after a frustrating romantic relationship but eventually expanded to also explore his own rocky love/hate affair with the music industry itself. It’s a very well organized and smooth project with features from a mixture of some very gifted musicians including Snoop Dogg, Kendrick Lamar, Charlie Wilson, U-N-I, Bad Lucc, and many more over 23 tracks. 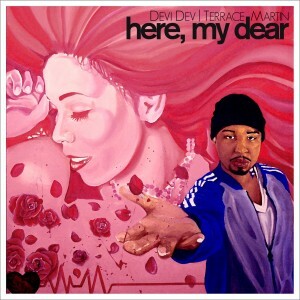 The artwork for the project was done by my talented brother retOne and the cover painting was done by Keenan Chapman. You can download the CD below.